These are actually two separate shots that I styled as a mirror image of each other. They were for a budget-focused accessories story that ran in a magazine where I once worked ;-) The expensive stuff is on the left and the similar items with lower price tags are on the right. To be frank it was so long ago that I cringe a little when I look at it. That's pretty common for stylists. You look back and see everything you woulda/shoulda done differently. I remember I was trying to capture a little of the glamour of a Jan Showers moment but with an icy wintery twist -- it was a January issue. Looks a little bare to me and VERY studio - not real at all. 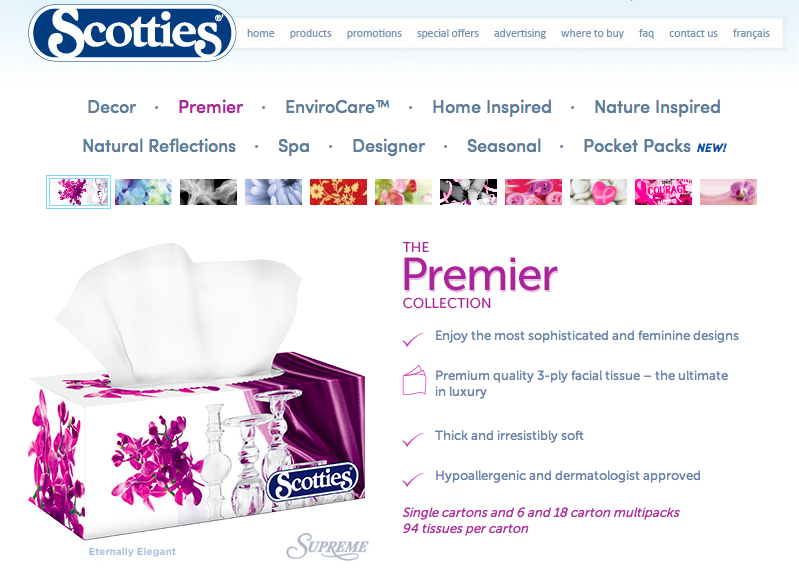 Anyhoo, looks like Scotties used the image on the left but had it flipped on the box. Interesting.